McGill’s School of Continuing Studies provides high-quality, technologically advanced, accessible and affordable education and services. Thanks to the generosity of our donors, the School has updated its classroom facilities, provided scholarships and bursaries to learners, and established career and professional development workshops for students and recent alumni. Find out more about how you can help with the School’s funding priorities below. Many of the School’s offerings are career-focused, so we provide our students with high-quality advising services. By supporting the School’s Career Advising and Transition Service, you will help our 15,000 students develop the practical knowledge and professional skills they need to achieve their professional, academic, and personal goals in a competitive world. The Career Advising and Transition Services provides students with the coaching, mentoring, and guidance they need to make informed decisions about their future and realize their personal and professional goals. They support our students as they transition into the job market, kickstart a new career, improve their employability, or integrate into their new country. The service’s future goals include providing our students with mentoring opportunities, as well as internships and a job board. The School strives to ensure that all hardworking and deserving adult students have the opportunity to pursue their studies, improve their knowledge and skills, and transform their careers and their lives. Fall 2012 was a real milestone for the School. We held our first scholarship reception, recognizing the academic achievement of 30 students and introducing them to their donors. These scholarships continue to make a big different in the lives of deserving learners. A lack of financial resources should not pose a barrier to a talented student; their academic pursuits help them achieve their career goals and ensure their success. With the help of generous donors, we have been able to provide continued financial support since 2013. Technical innovation has reshaped the workplace, and we at the School strive to ensure these innovations are reflected in our classrooms. By adapting tools such as webcams, recording facilities, and video-streaming software, we can expand the reach of the classroom experience. These initiatives will provide a lifeline for students who cannot physically attend class, such as parents at home with young children, working professionals away on business, or people with disabilities. The McGill Writing Centre is a valuable University-wide service for students in all disciplines to refine their academic and professional writing. Read more about the positive impact our donors are making on our students in the online edition of The Next Page. Have something in mind for your gift? You can make your gift online and designate your donation to The School of Continuing Studies (SCS), or you can target your gift to one of our top four priorities. Through the McGill Giving website. Please indicate that you would like to designate your gift to the School of Continuing Studies. Please indicate that you would like to designate your gift to the School of Continuing Studies. Have questions or comments? We welcome them and look forward to hearing from you. Has your contact information changed? Keep in touch by letting us know your latest email and mailing address. 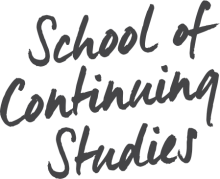 We welcome you to join the School of Continuing Studies online! Philanthropy has a lasting impact on the School and our students’ ability to transform their lives and those of their families. Your gift to one of our funding priorities[JM1] will have a direct effect on student success. More than 15,000 companies match gifts to McGill University. Does yours? Double, even triple, the amount of your annual gift to McGill School of Continuing Studies by participating in your employer’s matching gift program. For information on companies that match donations for employees, their spouses, and retirees, visit www.mcgill.ca/match. Commemorating a special or solemn occasion with a gift to the School recognizes someone special while also serving as a testament to your passion for learning. It is a great way to leave a lasting legacy and to honour friends and loved ones. –Naomi Kassie, McGill Community for Lifelong Learning Moderator, on her son David Kassie’s gift in her honour. Recognize someone and celebrate the milestones or achievements in an individual’s life, while contributing to the advancement of learning at SCS. Remember someone special, honour someone’s life, or commemorate the special relationship the individual had with SCS. To make a donation to In Honour or In Memory gifts, please call: 514-398-4840. Please indicate that you would like to designate your gift to the School of Continuing Studies. We are always looking for industry professionals who are willing to take a moment and share their wisdom and experiences with our students. We welcome topics relating to emerging trends in your industry as well as sourcing, recruiting and interviewing techniques at your company. Gifts to the School of Continuing Studies make a major impact by providing services and support that help our students realize their potential and achieve brighter futures. Through their generous donations, the Zeller Family Foundation and the State Street Foundation have enabled the School’s Client Services to launch career workshops. These workshops equip students with the knowledge and skills they need to launch or transition their careers and improve their employability and economic well-being. Our Job Search Series includes topics on crafting effective CVs, job hunting, and interview skills. These donations have also enabled the School to launch a workshop series for new immigrants, who are often marginalized, unemployed, or underemployed. Topics in our Professional Transition Series provides information on Quebec’s accreditation system, provincial labour standards, and communication and culture in the Canadian workplace. Paul Leong (B.Com ’81), established the School’s first endowed fund for Career Advising and Transition Services. The McGill Association of Continuing Education Students (MACES) has made significant financial contributions to improve services that support the School’s hardworking students. Much of MACES’ gifts have been designated to Career Advising and Transition Services, scholarships, and bursaries. MACES played a major role in supporting the research that helped establish the School’s Career Advising and Transition Services, and almost half of the Association’s fundraising donations have gone to scholarships and bursaries - rewarding academic excellence and helping those in financial need. The McGill Association of Continuing Education Students (MACES) has made a significant impact on students in a short period of time. Prior to 2012, “the School did not have scholarships or bursaries to recognize excellence or to give learners a hand,” says Dean Potter. Since then, almost half of MACES’ fundraising donations have gone to scholarships and bursaries, rewarding academic excellence and helping those in financial need. In 2011, Continuing Studies instructor Charles Pitts and his wife Manon Boisvert established the Boisvert-Pitts Bursary in Public Relations. Manon and Charles’s gift is helping students transcend financial difficulty to upgrade their skills, pursue new career paths, or obtain a much-needed certification or diploma to get ahead. Barbara Seal, a long-time Canadian Citizenship Court judge, and her husband, Donald W. Seal, QC, have provided generous funding for the School’s first endowed scholarship, the Barbara Seal, CM Scholarship. Rita Lumba-Bacani has committed $10,000 to create one of the School’s first named, direct-funded awards – the Rita Lumba-Bacani and Jun Bacani Scholarship in Accounting and Taxation and/or Entrepreneurship. When Rita Lumba-Bacani (CertMgmt ’88, CertAcctg ’88), came to Canada from the Philippines in 1969 to join her husband, chemical engineer Jun Bacani, she learned that her CPA license did not receive full professional status in her newly adopted country. Miranda Technologies funded a video and web conferencing facility that accommodates up to 10 on-site participants and several online guests for one-to-one and group discussions. This facility enables instructors at the School, many of them practicing professionals in their field, to interact more efficiently. The web-conferencing facility also fosters collaboration among instructors and graduate students in different locations.